This is the story of the Somersetshire Miners Association. Coal mining was carried on continuously for more than 200 years in the Radstock area of Somerset until the pits were deemed uneconomic in the early 1970s. The Somersetshire Miners Association was formed in 1872, and became a constituent union of the Miners Federation of Great Britain in 1889. In the years from 1892-96, it had around 2,000 members, rising to more than double that by 1910 before falling back to 2,600 by 1944. Long-time miners’ union secretary and agent S.H.Whitehouse. One of the most notable figures in the union was S H Whitehouse of Radstock, who served as secretary and agent from the mid 1890s to the end of the first world war, and represented the union within the federation and on public bodies. The following extract is taken from a special souvenir edition of The Original Bath Guide produced for delegates the TUC’s annual conference, held in the city in 1907. “The out-put of coal in the district is about one million tons per annum, and in the production of this out-put some five thousand persons are engaged. The workmen as a rule are industrious and thrifty. Their co-operative, temperance, religious and political organisations are kept in a state of healthful activity, and are generally well managed and closely watched. For very many years there has been in operation some kind of trades union, as for instance when the Mines Regulation Act of 1872 was passed, in which it was provided that weighing machines should be placed on the pit tops to correctly register the amount of coal .sent up by each person, it was found possible to secure by united action what the employers were not willing to grant. The miners also sent representatives to various conferences of miners in the early seventies, as for instance; Mr. Isaac Gould represented the Association of Somersetshire Miners at a conference held at Leeds in April, 1875. In the same year Thomas Curtis and George Carter attended a conference on behalf of the miners of Somerset at Swansea . There were two so-called National organisations at that time. One was called the National and the other the Amalgamated. The two conferences were held in the same month, and Somerset men were represented at both. 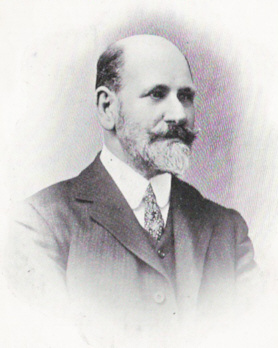 The President at Leeds was Mr. Alexander Macdonald, M.P., and at Swansea , Mr. Thomas Halliday. In the same year an arbitration was conducted at Radstock in which Mr. Alexander Macdonald, MP., was arbitrator on behalf of the workmen, and Mr. George Gilroy on behalf of the owners. Mr. Thomas Hughes was the umpire, and on behalf of the men Mr. Lloyd Jones and Mr. T. Halliday took part, whilst a prominent figure on behalf of the employers was Mr. James McMurtie. Somersetshire miners’ union offices, Radstock. “As a further evidence of the interest the Somerset miners took in National affairs may be mentioned the fact that Mr. B. Fish represented them at a deputation to Mr. W. E. Gladstone on the County Franchise question, held in January, 1884,at the Westminster Palace Hotel, London , and afterwards at the reception room of the Foreign Office. In 1888 Mr. S. H. Whitehouse accepted the invitation of the Association to become their Agent and Corresponding Secretary, he being the first who had held an office of the kind in Somerset , and grave doubts were expressed by many as to whether the experiment would succeed. At that time the district was under a sliding scale. The wages were extremely low, the organisation few in numbers, and low in funds. The organisation was completely re-modelled on more modern lines, and when the Miners’ Federation of Great Britain was formed in 1889 the Somersetshire Miners’ Association was one of the first branches, and Mr. Whitehouse was a member of the first executive of the Federation, and has occupied that important position on subsequent occasions. The strike which occurred in Somersetshire in 1889 was an integral part of the movement which resulted in the formation of the Miners’ Federation, one of the most powerful organisations the world has ever seen. The formation of the Federation and its demand for a minimum or living wage led to the great lock-out in 1893when for the first time the principle was conceded in what was known as the “Rosebery” settlement. The Somersetshire Miners’ Agent attended the conference of Owners and Workmen’s representatives called together by Lord Rosebery, the Owners’ representative at the time being Mr. John Batey,the present chairman of the Local Conciliation Board. These two gentlemen were signatories to the Rosebery settlement, the outcome of which was the recognition of the minimum wage, and the formation of the National Coal Trade Conciliation Board, and consequently of all the subsequent efforts which have been successful in keeping the Radstock district out of strikes, and enabling all matters in dispute between owners and workmen to be settled in a peaceful manner. The Somerset Miners are well organised, and as a consequence wages are very much higher than formerly. The general conditions under which they live and work are almost incomparably better. 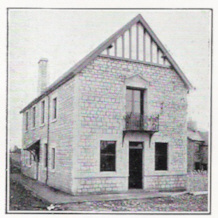 The Association has a substantial building which is used as offices and a caretaker’s house, as shown in the picture. This building is on freehold land, the land and building being the property of the Miners’ Association. There is also a substantial balance standing to the credit of the Association either in the local banks, or invested in sound securities. Coal mining was continuous in the Radstock area of North Somerset from 1763 until 1973 – the last collieries to be closed were Lower Writhlington and Kilmersdon. Little is obvious to the eye now, as most of the tipping areas (known locally as batches) associated with coal-mining have been landscaped. It is difficult to believe that within the pleasant undulating countryside around Radstock there have been over 50 collieries serviced by tramways, railways and canals. However, there are a few obvious signs: the batch (tipping area) of Old Mills Colliery a little to the north-west of Midsomer Norton is the most obvious one, and the tell-tale ranks of miners’ cottages clinging to the sides of the hills are another. Outside Chairman – Judge Austin ( Bristol County Court ). Minutes, accounts, correspondence and other papers from 1868-1964 are housed in the Special Collections Department, in the Arts and Social Sciences Library of the University of Bristol .